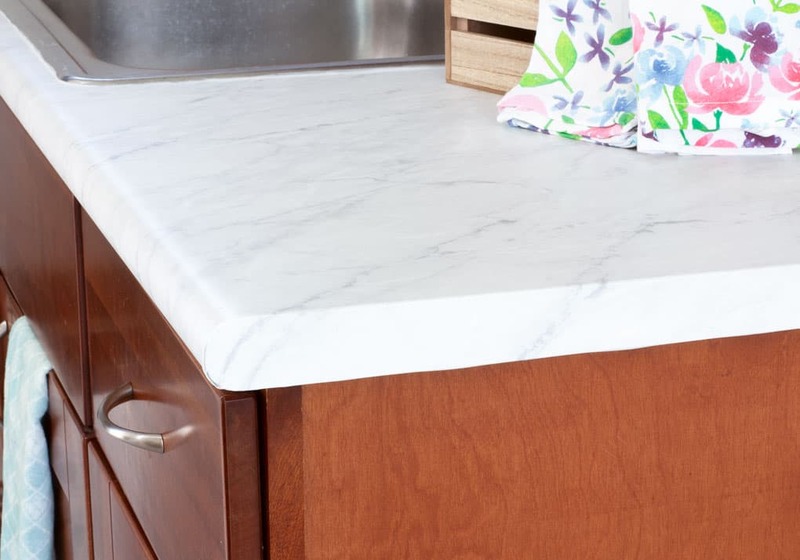 Installing new countertops, whether in the kitchen or bathroom, can be pricey… and sometimes not an option (in rental homes or apartments). 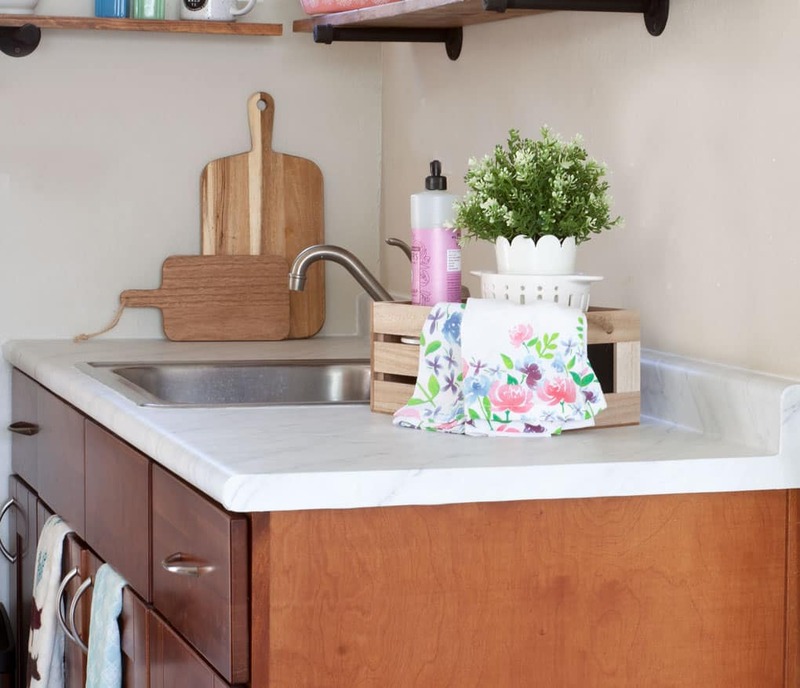 This post will show you how to DIY cheap countertops with contact paper, also known as adhesive film, and make your kitchen look like a million bucks! After the reveal of my new kitchen countertops, I received quite a few questions. So I thought I would try to answer the questions in this post, along with sharing a tutorial. 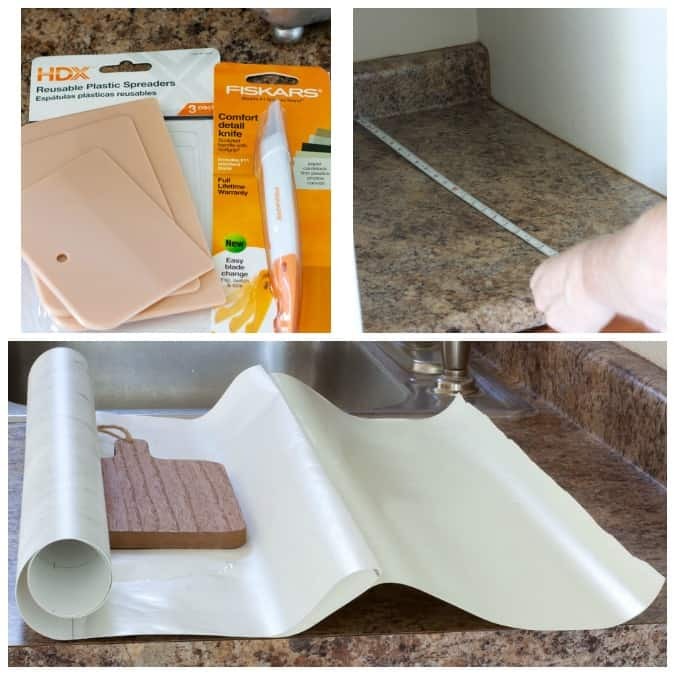 These adhesive film countertops are a perfect solution for those living in rental homes or apartments, or even those who own their home and are simply on a tight budget. This durable contact paper is AMAZING! Because the paper is so thick, it looks like marble and feels like laminate. And, the cost for my counter space was just under $50. Pretty crazy, huh? Here are more thoughts on living in a small rental home! The contact paper is very durable, very thick, and VERY sticky, but pretty easy to work with. The best trick for working with it is to spray lots of water on the counter before applying the contact paper! Seriously! If I had to do it over, I would even put just a tad bit of liquid dish soap in the water. This enables the paper to be moved around and applied properly. Then, as you smooth the paper down (with a squeegee type tool), the water ‘gushes’ out from under the paper (onto the floor and your clothes, no less) and the paper remains stuck to the counter! Pretty crazy, again, right?! Even though the contact paper is really sticky, it can be lifted and re-positioned over and over! In order for the adhesive film to fit nicely around the edges and corners… I used trick number 2! Grab your handy-dandy hairdryer! This film becomes very pliable with just a little bit of heat. When you begin applying heat, you will notice the paper start to soften… after about 10-15 seconds, it almost feels like it’s melting. At this point, you can quickly and gently stretch the paper around the corner first, then the edge. It works just like using shrink wrap! Pretty crazy number THREE!!! 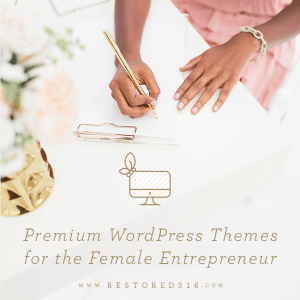 Don’t worry if you make a mistake… you can reheat, lift off, and start over again. 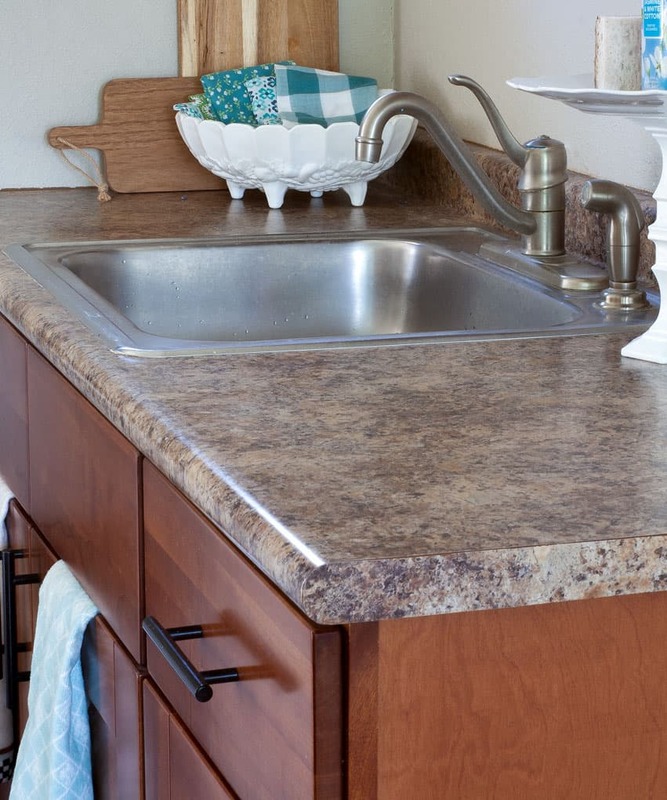 Clean your countertops with soap and water, making sure to wipe away any little crumbs or debris (you don’t want those little boogers trapped under the paper because they will just look nasty!). Make sure you have all the items on your list at your fingertips. 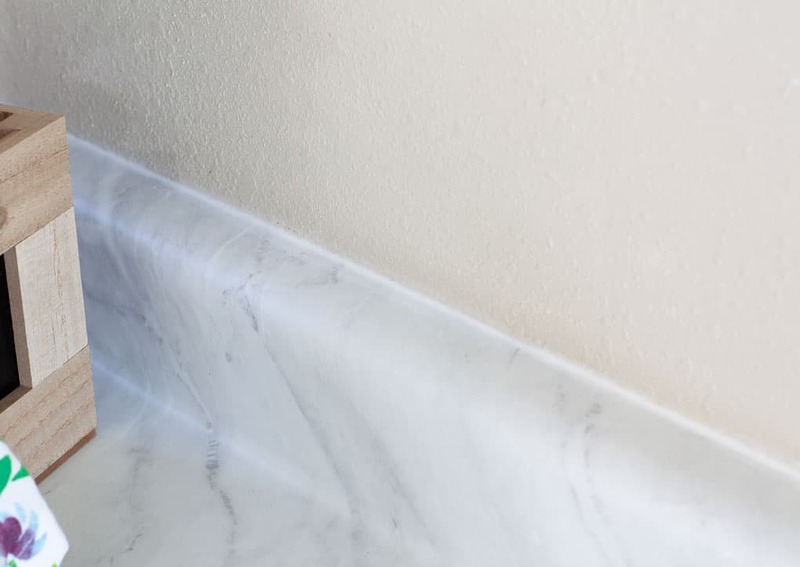 Measure your countertops and backsplash, adding 4 inches to the length (to ensure you have room for trimming after you have applied the film). This is the length you will cut your adhesive. Pull down the paper backing from the adhesive about 6 inches, then fold the paper. 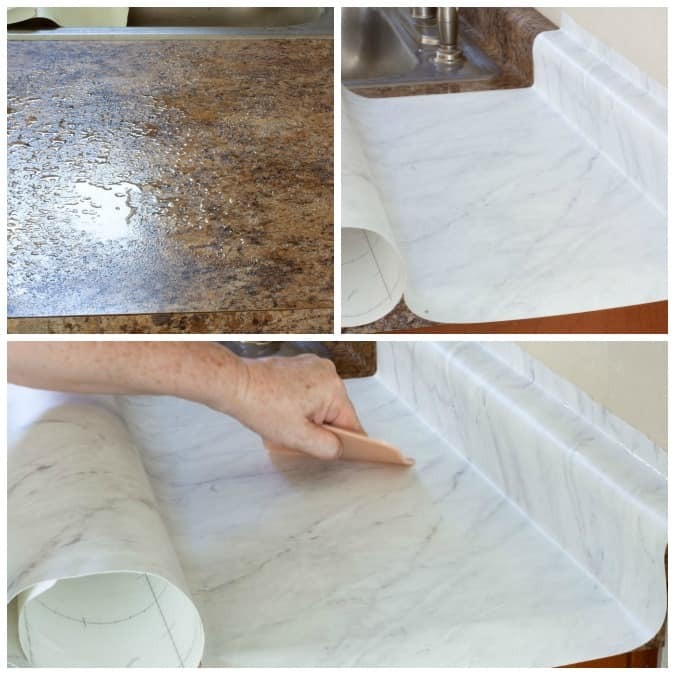 Make sure that as you finish smoothing out the paper, you get it flat and tight along the bends and creases of the backsplash area. 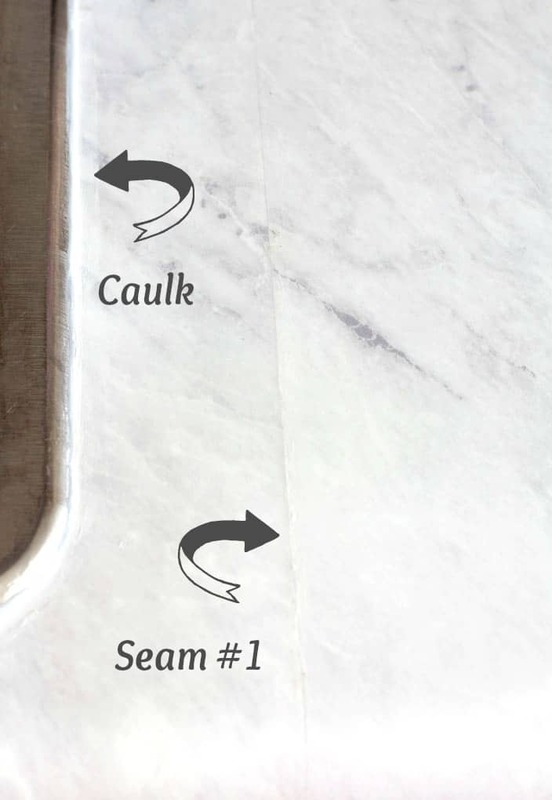 When you get to your edges and corners, use Trick #2 (see above). 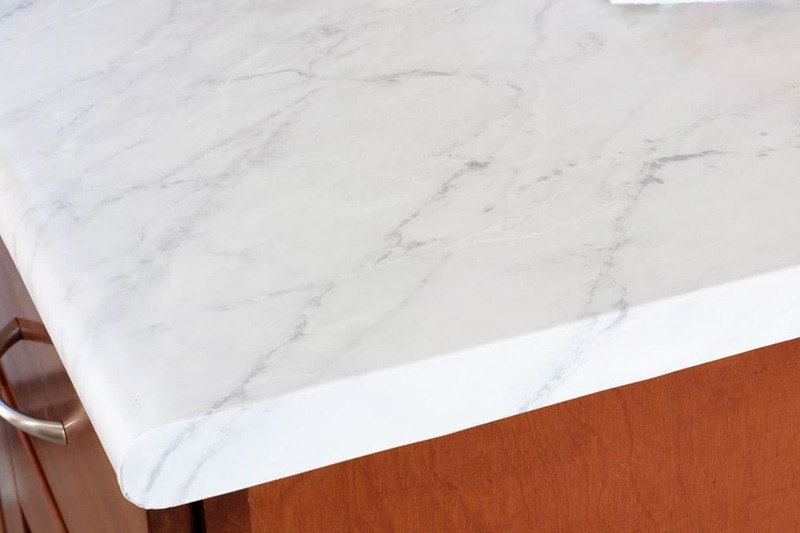 After your counters are covered, cut off all your excess at the top of the backsplash, front edges/corners, and around the corners and edges of the sink area with a very sharp razor or exacto-type knife. Mine looked like this after I trimmed it…. 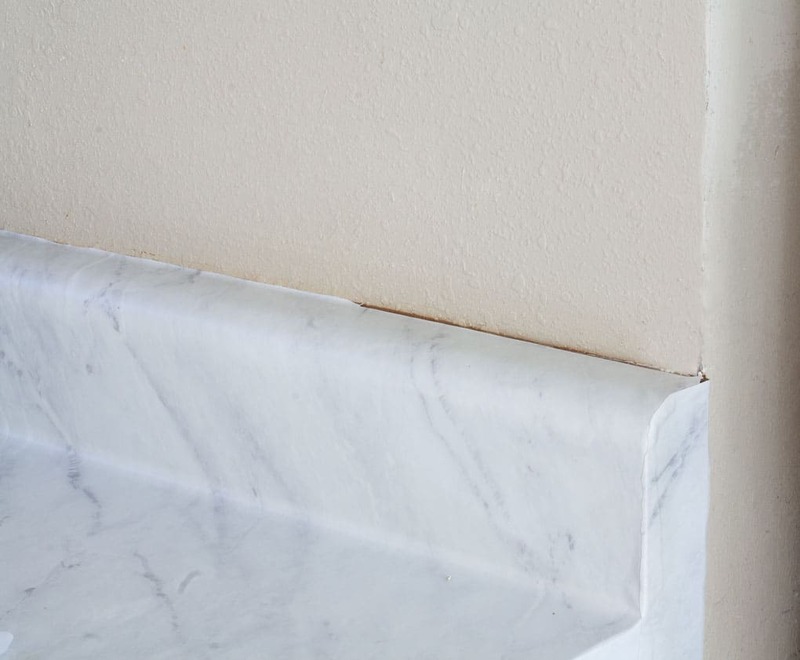 Seal around the edge of the sink and the top edge of the backsplash with caulking for a smooth look. This also helps to keep water from getting under the adhesive film around the sink. The second seam met at the front and back of the sink, and this time I overlapped the vinyl. It was even less visible than the first. But remember, this was at the edge of the sink. Not sure how easily items would slide over a flat counter area, if the seams were overlapped. I guess this would be a matter of preference! Using adhesive film was fast and relatively easy… it took one morning/afternoon with several breaks for me to cool down on this hot So. Cal. day. Instant results… I didn’t have to wait for curing, drying, etc. Once the film is applied, and your are happy with the results, you are done! They can be used immediately! Adhesive film is super durable… According to the research I have done (and from other personal testimonies from people I trust) it won’t scratch, chip or peel. It’s removable and replaceable! 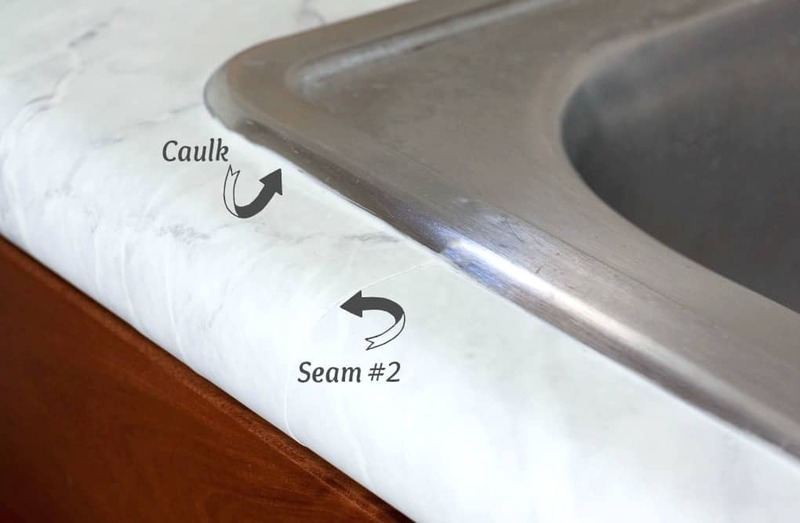 If, by any chance, something happens to it (like a hot pot is put directly on the counter, or someone gashes it with a knife), that piece of the contact paper can be removed and replaced with little time/money/effort (unlike a regular laminate countertop)! If I get tired of it, I can change it out for less than $50. As, I said before, it’s a perfect solution for an apartment or rental home because it’s removable! So, after having these counters for over a month now, I feel like they are just as durable and user friendly as the laminate counters that are underneath. They just look a WHOLE LOT PRETTIER! What do you think? I even added some affordable polished nickel hardware (these are similar to what I used, and even more affordable) to brighten-up the cabinets a bit! If I can’t paint the cabinets (at least until I get the courage to ask my landlord), this is the next best thing, and I LOVE it! 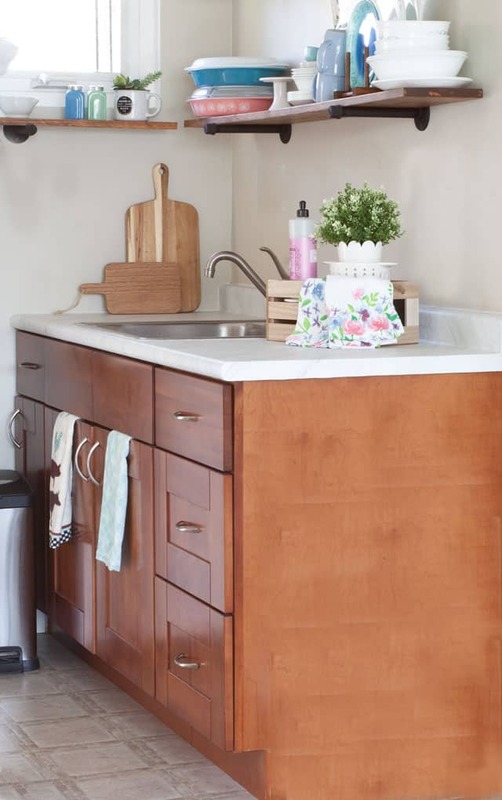 Check out the full reveal of my diy cheap countertops that look expensive HERE! Let me know in the comments if you have any questions! What do you think? Is this something you might think about doing? Wow! That looks terrific! Thanks for the great tips. It seems very doable!! Yep… I KNOW that *you* could do it! Enjoyed our ‘date’ this morning! Love ya! Thanks, Rita! They are really quite wonderful. 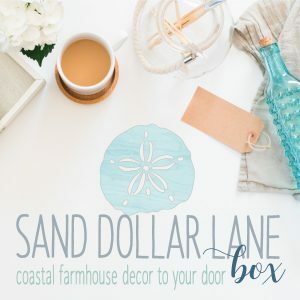 I love that they are affordable, durable AND so pretty! Thanks for the kinds words, dear friend! I would have NEVER guessed that was the way you did it! What a neat trick. I have only applied contact paper to foam board, which unfortunately would not work in quite the same way. 😉 Looks amazing and feels amazing not spending lots of money to have nicer counters in your rental. Win! LOL!!! Glad I was able to surprise you! Yes, I would normally use a regular contact paper for foam board, but this is much more durable and heavy, so it needs a couple of ‘tricks’ to apply properly. Nika was over last night, and commented, again, what a difference it makes! Hugs, dear heart! What a great tutorial. I’m sure this will come in handy for many people. Pinning! Thanks so much, Patti! I really do hope it’s something others find helpful…and beautiful! Hugs and hearts! Total perfection Julie! So impressed with your tutorial. Thank you, Barbara! You are such a faithful ‘sharer’ and friend! And thank you for the kinds words! Hugs! That’s amazing-I never would’ve guessed it was contact because it looks so expensive! Aw, thank you, Barbara! 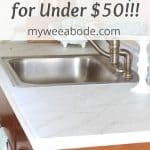 I hope this helps others that are on a budget, or are in a rental home! It really is a wonderful solution. And there are so many styles to choose from! Thanks for dropping in! I love budget makeovers and this one is incredible! What a transformation!!! Pinning! Thanks so much, Roxanne! I’m, obviously, quite please, too! 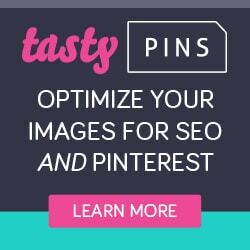 😉 Thank you for pinning! 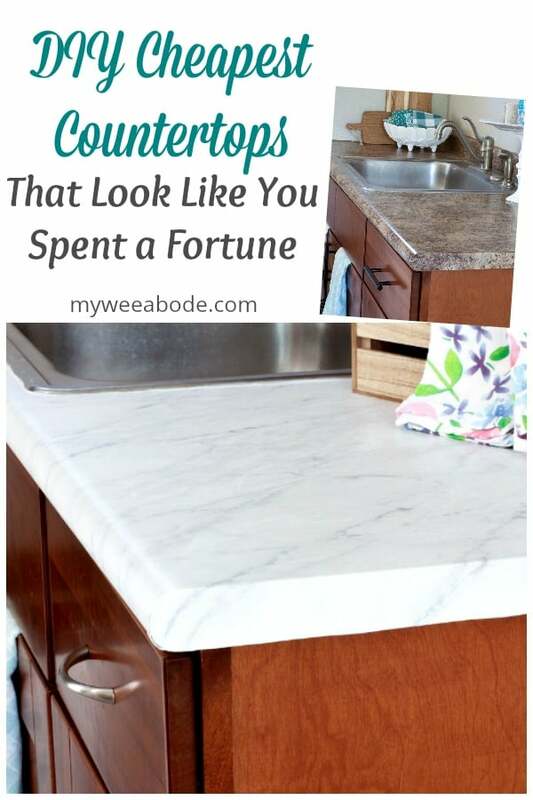 Your countertops looks so beautiful. One would never guess that you used contact paper. Such a smart and good option for renters. Thanks, Lauren! Yes, great option for rental homes and apartments. Even those on a budget can do this in the homes they own… even just to ‘tide them over’ until they can do more expensive update! Thanks for coming by, sweet friend! Omgosh Julie! That looks fantastic! You have such an artistic touch! LOL! Thanks so much, Melan! That means a lot to me, dear friend! Was so nice to spend the weekend with you and all our friends! Hugs! It was a wonderful weekend. I am so blessed to have you and all the other ladies in my life! That is a pretty amazing transformation. What a great new look. You probably know this but you can use any fabric on walls and use starch to make it stick yet it is removable and a great option for a rental. Possibly an idea if you feel the need to change the wall color without painting. Hi, Tonita! Thanks for the kind words. 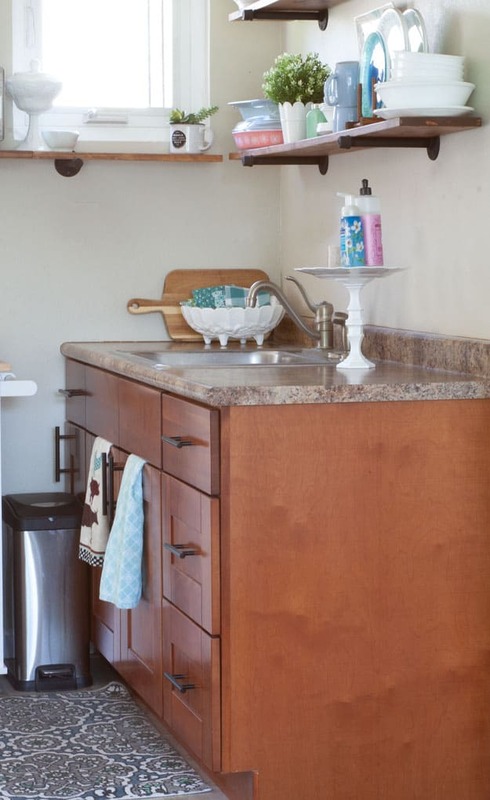 Yes, I have seen the fabric and starch used on in other homes… it’s pretty, and a great idea for rental homes! 😉 Hugs!